The World Championships are fast approaching - it is now less than two leeks until we fly out to Bueno Aires in Argentina to take part. 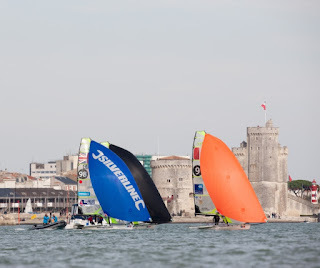 With little racing between the summer season and the Worlds, we decided to take a trip over to a regatta in La Rochelle in France to keep us sharp. It was a bad start to the event for us. We broke the only mast that we had out there on the way out to the first start. We raced on, borrowing a mast from another British team and, with the help of our Silverline tools, we just about made it back out in time for the 2nd race of the day - phew! The rest of the day went very well considering and we clocked a 5, 1, 1 to put us 4th overall. The next two days of racing were tricky, with some wacky conditions and a rig that we did not know. 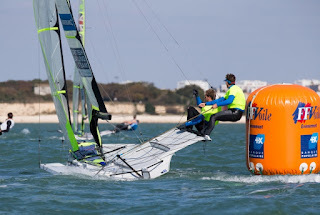 But we made the best of it and rolled into the medal race close to the lead in 3rd place. Unfortunately, the medal race did not go our way and we did move up but only into Silver. Still a cracking result, given what we went through and had to sail without a discard all series after missing the first race. After a great week off at home, including some cross training in Moths with some of the other guys in the British Sailing Team, it was time to get back to business at the National Ranker of the year, back on one of our better rigs again. The race officer did a great job over the two days of racing to get in 10 races! We were on top form, winning seven out of the ten races and never finishing outside the top three. It was a great way to finish off our racing before we head to Argentina. We really feel as though we are just getting better and better, learning things each day and stepping closer to our ultimate goal of Olympic glory.